Extended SKU - This adapter is part of an extended catalog of products tailored for customers in specific markets or with specific workloads, requiring the utmost in performance or value, but typically have a longer lead-time. 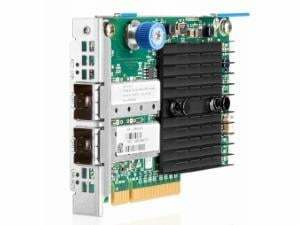 The HPE Ethernet 10Gb 2-port 546FLR-SFP+ adapter for ProLiant rack servers are designed to optimize Cloud efficiency, and improve performance and security of applications – especially where I/O, block storage and database performance are critical and the need for maximum VM density and up-scalability are greatest. It offers a rich set of offload technologies including overlay network tunneling and storage as well as RDMA over Converged Ethernet (RoCE) capabilities that increase host efficiency and virtualization performance. The HPE FlexFabric 546FLR-SFP+ can provide up to 40 Gb/s of converged bi-directional Ethernet bandwidth, helping to alleviate network bottlenecks.